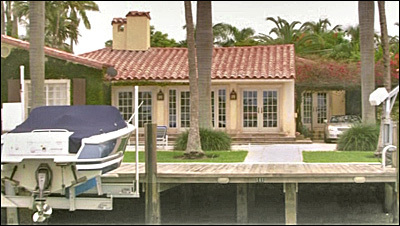 Dexter Filming Locations: The Smuggler's Home. The location: The Smuggler's House. A. The marina home of a smuggler / murderer. A. In "Reefshore Marina", in Miami. A. In Episode 5 (of Season 1), "Love American Style". 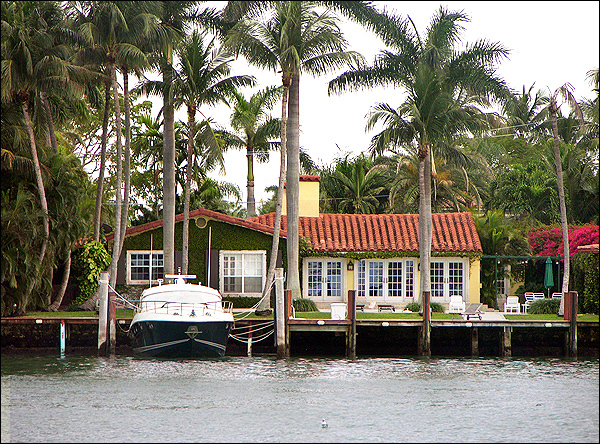 We see Dexter out on his boat, floating offshore of the posh Mediterranean-style home of his next victim: Jorge Castillo, a ruthless "coyote". Castillo smuggles Cuban refugees into the country, then demands a ransom from their relatives, and if he doesn't get it, he kills the refugees and dumps their bodies out in the sea, to make it look as if they drowned there. Castillo runs his operation out of an auto salvage yard, where he imprisons his immigrant victims in squalid conditions until their the blackmail is paid - or until he murders them. 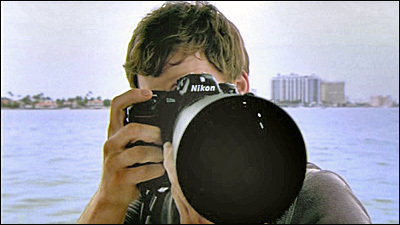 After a boat full of pretty girls passes by, Dexter turns the long lens of his Nikon camera on Castillo's waterfront home. He shoots photos of him as he walks into his home and is greeted by his pretty blonde wife. Dexter is sorry to see that Castillo has a wife, since (he muses) he doesn't enjoy making someone a widow. Dexter assumes that the wife has no idea what her brutal husband is doing. But he's wrong (as he finds out later). After dark, Dexter sneaks aboard Castillo's docked boat and finds the refugees' dead bodies hidden there. A. An island home in Miami. A. There is no "Reefshore Marina" in Miami (or anywhere else that I know of). The Mediterranean home isn't in a marina at all. It's actually at 141 N. Hibiscus Drive, on the northeast side of Hibiscus Island, in Biscayne Bay, Miami. Here is an aerial photo of the home. The boat with the girls is passing east to west (or southeast to northwest). 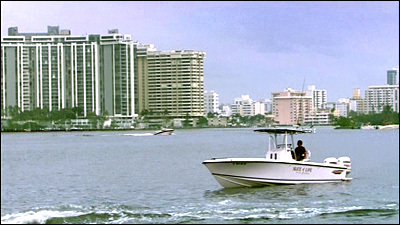 The tall buildings seen on the shore behind Dexter's head are on Belle Island (the easternmost of the Venetian Islands) - except for the small pink building on the right, which is located on the western side of the Miami Beach coast. A. This one was tough. First, I thought they might have shot it at Marina Del Rey (in Los Angeles), but a closer look convinced me that they were still in Miami. Since the boat full of girls cruises right by the house, I knew it faced the water. I spent a long time using Live Local's maps to study many of the islands in the Bay, but to no avail. So, I switched strategies and began looking for the tall buildings you can on the shore in the distance (behind Dexter) in the scene. I scoured the entire Miami mainland coast and part of the Miami Beach coast without finding them. Then, fortunately, I decided to take a second look at the establishing shot shown right before the boating scene. It was the usual aerial shot of the bay, so the chance that it would actually show the area in question was remote. But I lucked out. After I mapped it out, the aerial shot turned out to be looking south from Hibiscus Island, so I started searching that area. 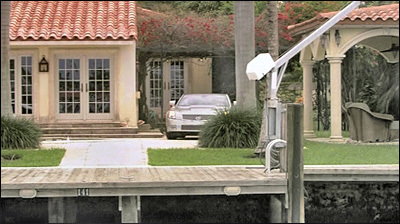 I quickly spotted the house used for the filming - complete with red tile roof, green lawn out front with its walkway, the boat dock, even the colorful bougainvillea blooming near a corner of the roof. And I could also see another home nearby (which can be glimpsed as the girls' boat passes by) with a distinctive red-tile cupola. But I was still curious about the location of those tall buildings in the distance, behind Dexter. The ones I couldn't find earlier. I determined that the camera must have been looking northeast, and drew a line on the aerial map to approximate the camera view from the position of Dexter's boat northeast to the shore. Sure enough, that allowed me to find the right buildings rather quickly. The reason they were hard to find before is that they weren't on the Miami Beach coast, as I had expected, but were instead on an island (Belle Island) just off the western coast.